“This story is totally false and deliberately libelous. I have never met Julian Assange or anyone connected to him. I have never been contacted by anyone connected to Wikileaks, either directly or indirectly. WikiLeaks is suing The Guardian for libel over this serious fabrication. Bringing legal action in UK courts is extremely expensive. WikiLeaks is entirely funded by the public and urgently needs your support. We must hold The Guardian to account: your contribution will help make this lawsuit possible. Please make a donation today. Thank you for contributing to help WikiLeaks take legal action over the fabricated Assange-Manafort meeting story. This GoFundMe was opened by the Courage Foundation, which supports journalistic sources around the world. WikiLeaks is a Courage beneficiary. GoFundMe donations, collected in USD, will be withdrawn into Courage's US-based bank account, from which they will be spent on expenses related to this legal action. Bringing legal action in UK courts is extremely expensive. WikiLeaks is entirely funded by the public and urgently needs your support. Donate now to hold the Guardian accountable! 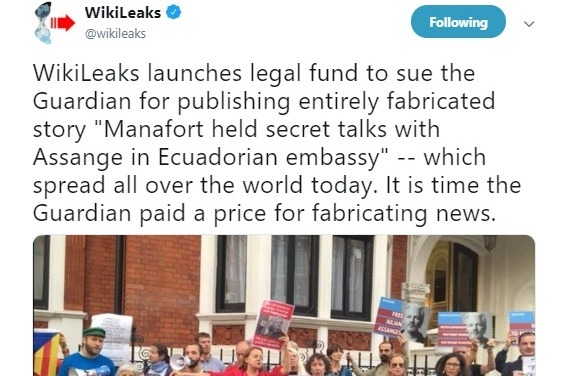 It has now been over two months since the Guardian published its Manafort-Assange fabrication. The paper continues to refuse to answer questions about its supposed "sources" and to provide any evidence for its baseless assertions. Since our last update this outrageous fabrication has had ever more serious consequences. WikiLeaks and Julian Assange still need your support in order to proceed to take legal action against The Guardian. - The Washington Post points out, in an article called "Beware of the permanent exclusive": "A representative for the Guardian declined to comment beyond the outlet’s previous statement [...] We didn’t get a denial, of course, can never substitute for an affirmation of anything. [...] Time is a friend to none of these stories. The longer they remain on their evidentiary islands, the more marginalized they become." - The Intercept's Glenn Greenwald ranks the "Paul Manafort Visited Julian Assange Three Times in the Ecuadorian Embassy and Nobody Noticed (Guardian/Luke Harding)" story #4 in his countdown article: "Beyond BuzzFeed: The 10 Worst, Most Embarrassing U.S. Media Failures on the Trump-Russia Story"
The Guardian's fabricated article anticipated serious consequences for Julian Assange, noting: "the last apparent meeting is likely to come under scrutiny and could interest Robert Mueller, the special prosecutor who is investigating alleged collusion between the Trump campaign and Russia". The letter didn't stop there and shows how the Manafort story is being instrumentalised to pressure Ecuador to end Julian Assange's asylum: Pompeo is asked to seek out "the status of the Ecuadorian Government's discussions with the British Government regarding Julian Assange", noting that "it is imperative that [Julian Assange's presence in the Ecuadorian Embassy in London] be resolved swiftly. We trust that you will remain in close contact with Foreign Minister Valencia on this matter." Three days after reports by Reuters, AFP and EFE on the meetings, the Ecuadorian Foreign Ministry officially confirmed that it was cooperating with the United States efforts to put Assange in prison. The Guardian has not reported further on its Manafort story since it originally published it on its front page. The reason is clear: it cannot back it up and knows it is false. WikiLeaks and Julian Assange need your help to fight back against this deliberate, malicious libel. Please donate again, share these updates with your social media following, stay informed and encourage others to make noise and donate to the fund to press the Guardian to retract its false story. Ecuador continues to turn up the pressure on Julian Assange: former Ecuadorian President Rafael Correa, himself charged by the new President Lenin Moreno. reveals that Ecuador has begun a “Special Examination” of Julian Assange’s asylum and citizenship. We’re almost at $50,000! Share this link and donate now to help WikiLeaks fight back against The Guardian’s defamation. It has now been three weeks since The Guardian published the fabricated Assange-Manafort story. He added: “I'd like to ask again: how can a news outlet like @guardian possibly expect credibility when it demands transparency and accountability from other powerful institutions when it stonewalls and ignores all public inquiries in a case like this? They're stonewalling more than GCHQ. - Independent journalist and author Matt Kennard has pointed out that one of the authors of the Manafort-Assange fabrication, Luke Harding, has fallen silent since the publication of the story. "Where’s the @guardian’s Luke Harding? He hasn’t published a story for three weeks. Has he been put on gardening leave after the fabricated frontpage Assange-Manafort story? #fakenews #boycotttheguardian"
- Finally, @AssangeLegal notes that The Guardian’s Media Group endowment and cash holdings total £1.01 billion, a reminder of what WikiLeaks is up against. WikiLeaks ’s legal team is in discussions with libel lawyers and needs all the help it can get. Thank you for your donations thus far, and please continue to share articles and links about the fabricated article, as well as this GoFundMe link as widely as you can.